(PhysOrg.com) -- The extraordinary Caspian Tiger became extinct over 40-years ago. Through modern genetic analysis it has been discovered the Caspian Tiger and the Siberian or Amur Tiger still in existence are separated by only one letter of genetic code. The Caspian Tiger can be reestablished by using their relative, the Siberian Tiger. According to John Seidensticker, a tiger conservationist this means the loss of only a part of a subspecies as opposed to the loss of a whole subspecies. In practice, the zoo breeding programs for the Siberian Tiger are largely successful. The Caspian Tiger,(Panthera tigris virgata) genetic roots span over a million years. A nearly cataclysmic event during the late Pleistocene Era, some 10,000 to 12,000 years ago nearly wiped out all tigers. Fortunately, a small remnant of tigers survived. In 2004 scientists revised the known classification to five tiger subspecies from eight previously identified. The Caspian Tiger and the Amur or Siberian Tiger began in China and spread westward along the Silk Road. Sometime later these magnificent tigers expanded their territory by moving northward and eastward into what is known as the former Soviet Union. Researchers believe that sometime in the early 1900s the Caspian and Siberian tigers intermingled, but were subsequently isolated by hunters. The two majestic Russian cats, the Siberian and Caspian Tigers preferred slightly different terrain. The Siberian Tiger prowled the rich mix forest in the southern Russian Far East region on the Sea of Japan. While the Caspian Tiger inhabited the inland drainage basins of Western and Eastern Asia among the reeds and waterways hunting their prey hidden by lush vegetation. The Caspian Tiger was an exquisite specimen in appearance and size, weighing in a range of 375-530 pounds with an average body length of nearly 10-feet. During the Winter the Caspian Tiger had a lush, thick reddish coat with black or brown stripes set in a close pattern with a silky haired white belly and a beard. The word that best describes the Caspian Tiger, is formidable. 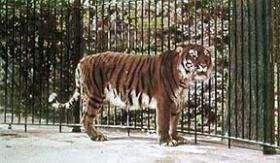 Unfortunately, the riverside vegetation was cleared for cultivation and in-habitation, thus the Caspian Tiger was deprived of its habitat and its prey in the 1930s. Cotton fields were planted and the rivers were used for irrigation. Soon, the Caspian Tiger became an alien in its own territory and was targeted and hunted down as a menace to human settlements and a threat to livestock. The Caspian Tiger pelt was prized for its beauty and fetched a hefty price. A further environmental insult occurred when the river vegetation and reeds were cleared to eradicate malaria on the Southern shores of the Caspian Sea in the 1950s and 1960s. The last reported Caspian Tiger sighting happened in the 1960s and 1970s. Russian and international conservation groups banned tiger hunting in 1947, but it was too late for the Caspian Tiger to make a recovery. Poaching and contributing factors wiped out the majestic cat. Conservation efforts did help to protect and stabilize the Siberian Tiger. Fortunately, the subspecies commingling in the distant past will allow the Caspian Tiger to once again take its rightful place in the family tree of tigers.